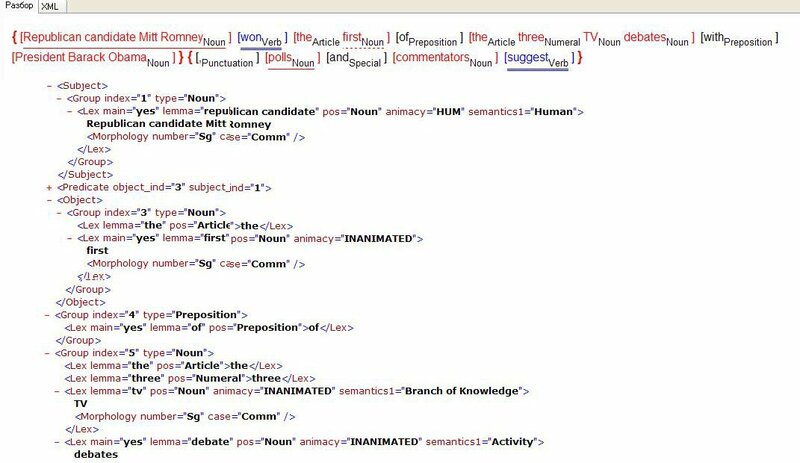 PROMT Syntactic and Semantic Analyzer interprets sentences of any level of complexity and nesting. As PROMT has been developing machine translation (MT) engines for over 25 years, it has created advanced algorithms for natural languages analysis that can be used not only for MT but also for data mining, text search, and abstracting systems. The default linguistic database contains 30+ million word forms and allows entering new words and patterns such as new semantic classes or user-defined syntactic patterns. The toolkit for entering new classes and patterns can be delivered to the client together with PROMT Syntactic and Semantic Analyzer. For nouns: gender, number, semantic marker, animate/inanimate object, etc. For verbs: person, number, tense, gender, voice, mood, reflexivity, transitivity, semantic marker, etc. Identification of special lexical items such as people, dates, locations, etc. The output format is XML which can be easily analyzed. The product kit also contains a tool to visualize the analysis output for human expert evaluation. Republican candidate Mitt Romney won the first of the three TV debates with President Barack Obama, polls and commentators suggest.